My eyes were like tea cups filled to the top as the week began last week – ready to spill over into the saucer with the least little tremble of my hands. I wanted to give credit to hormones. Maybe I had a virus. My tummy was a bit uneasy. I fought against tears, Get a grip Carmen. You know that feeling? When your insides are fluttery and you want to cry? Sometimes we know what’s going on with ourselves, and sometimes we are unsure. We just know it’s something. It was unshakable. Please Lord, help me understand what’s going on so we can fix this! By evening time, I thought, you need to have a good cry. But, what was I crying about! I stood in the shower and squalled as we say in the south. You can cry the ugly cry in the shower. During those tears, I made myself think about what I was truly feeling. The feelings that were hiding under the exterior of all is okay. Fear is ugly. Fear is real. Fear is a thief. It steals, kills and destroys our hopes and dreams. Just pouring out those real, life feelings and watching them swirl around the drain in my shower and disappear did help me feel better. A good cry usually does. I didn’t want this to be just a good cry though. I want change. Then I remembered something a dear friend and mentor, Margaret, told me once, “Carmen, perfect love cast out all fear”. (1 John 4:18) Is it that we don’t fully understand God’s love for us? I did what I usually do when I am seeking, I open my heart and my eyes wide. I want to notice when God is speaking. Something caught my eye. 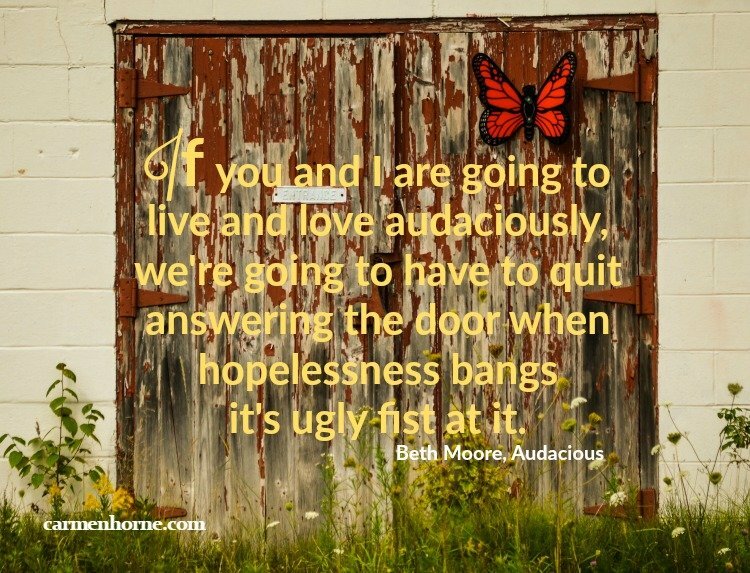 Beth Moore’s new book, Audacious, has been sitting on my desk since September – 4 months. The title drew me. The first few pages had me spell-bound. The father of lies (John 8:44) can be a powerful conversationalist. He sounds familiar. I think what he probably does it just use our own words against us. Lord, help us speak grace and truth to ourselves. Change often comes when where we are gets just too uncomfortable to stay. Lord, help us feel uncomfortable with everything except Your truth. I’ve had many of those same fears sweet friend, and look at the beautiful words God gave you to bless others. Hope to see you at the next girls gathering again. Don’t you wish we could let go of those fears Debbie? So glad you stopped by for a visit. Blessings on you! Liz, you are such an encourager. Thank you for nudging me forward with your kind words. Love you friend. Truth that sets us free and makes us say “Ouch” sometimes, right? Glad you stopped by for a visit friend. Carmen, I can totally relate to what you’ve described. Fear has been an area in my life that I’ve had to deal with. We all do… just at different degrees. I love that your friend reminded you of His perfect love. That is where the healing occurs, but it’s a process of continued awareness and what I call – “stepping into love.” Every time fear creeps in, I have to make the choice to step into His perfect love. That is where I am able to see my circumstances through the lens of truth. I will be praying for you. Thanks for sharing your heart. I love that, Edith, “stepping into love”. I will definitely be reminding myself of this often. Thanks for visiting! You have no idea how many things go through my mind everyday as a women; it’s hard. What spoke to me most is how you have a fear over your weight and not a lot of women admit it. I’m not overweight but I am obsessed over my figure and my physical and feel like I will never measure up and it wasn’t until I cried to my husband about it that I kind of got over it. I mean, it still bothers me but it’s not the same deal as it once was. Now I run every morning and tell myself I’m beautiful to keep my mind from straying away. Love your blog; check out mine at http://www.tru.works where you get the chance. Oh yes Brenda. Worry is definitely a successful trick of the enemy. Thank the Lord, Jesus is our provider. This post was perfect timing, Carmen! Thanks so much for sharing your heart and the truth that we need to turn to God’s word in these times! Blessings! God has blessed me with your testimony today Darcy. Hope your day is wonderful! I think most girls recognize that feeling! Thanks for stopping by Crystal. I appreciate you. I know the feeling, Carmen, when one feels like crying but can’t always pinpoint the reason. Sometimes it’s hard to get to “The feelings that were hiding under the exterior of all is okay.” I’m so glad God gave you release. So much of what you’re afraid of resonates with me, too. May we find refuge in Him! I love the short prayer – “Lord, help us feel uncomfortable with everything except Your truth.” Amen! Blessings and hugs to you! Digging deep to find truth is necessary but uncomfortable Trudy. I’m so glad you stopped by to encourage me today friend.